Claim Pole Position at the William Hill Poker Grand Prix! The 2006 William Hill Poker Grand Prix is revving up to be a high-octane spectacle this year worth a guaranteed £500,000! Yes, that is half a million pounds, or nearly 1,000,000 in US Dollars. This giant prize fund includes a huge contribution in added money by the sponsors William Hill – no less than £164,000, an overlay that most of the invited top professionals will not be resisting. The event is scheduled to be filmed over the period from 16th October to 24th October, with the draw for heats taking place on 3rd October. Apart from the professionals, the rest of us mere mortals have a large number of opportunities to grab a slice of the action. Some have already done so! Many via online qualifiers at William Hill Poker and yet more via live qualifiers at selected locations in England, Ireland, Paris and Sweden. 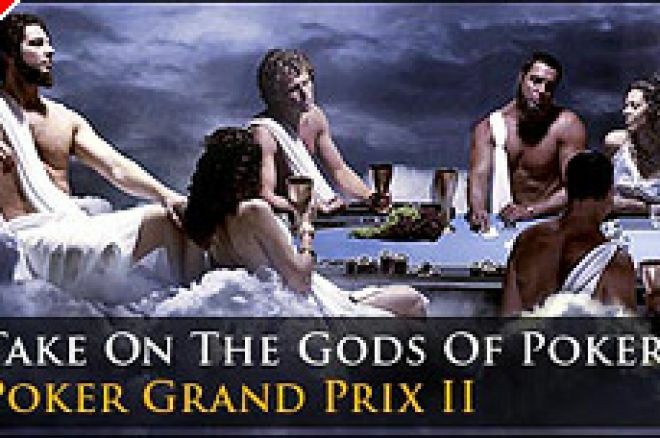 The "package" on offer to the qualifiers is a £6,000 buy-in to the 56-runner field for the televised 2006 Grand Prix and travel expenses and hotel accommodation during the event, plus full hospitality and merchandise. All qualifiers to the Grand Prix will get the chance to take on the best players in the world in front of the Sky Sports cameras! There are 56 exclusive seats in the 2006 William Hill Grand Prix of which 42 will be invited professional buying in directly. A further eight seats are available through online qualifiers with the remainder being won at offline qualifying events. Although there are eight Grand Prix seats to be won through William Hill Poker online, four of these have already been snapped up! So, there are four left but you have plenty of time to get to work. On Sundays 10th September and 24th September, the two remaining Grand Prix Finals are taking place each offering two guaranteed seats to the televised heats, each seat being worth £6,000 plus expenses. A direct buy-in of £120 + £10 is available for these Sunday qualifiers but you can also qualify to play in them via sub-satellites ranging from £2 to £33 on a daily basis. There are also only two UK/Ireland-based offline qualifiers remaining to be decided, the first of which comes up in Dublin, Ireland at the Fitzwilliam Card Club on 8th September, this Friday night. This will be limited to 150 players and is a €150 rebuy tournament (90 minute rebuy period plus add-on) starting at 8pm sharp. The final offline qualifier is in Birmingham, England, at the Broadway Casino on 27th September. This will be a £100 rebuy tournament (90 minute rebuy period plus add-on) also starting at 8pm. The ultimate winner, USA professional Phil "Unabomber" Laak described the tournament as "awesome". Fellow American, Antonio "The Magician" Esfandiari believed it to be "one of the best tournaments I've ever played in", while Hendon Mobster Barny Boatman said "this is the future of televised poker." Find out for yourself and get qualified! Ed note: Qualify for the Grand Prix by downloading William Hill Poker today.